The SSI Biology team spans the intersection of life sciences and space, with a focus on enabling technologies for biological experimentation in extraterrestrial habitats, astronaut life support, and, eventually, space colonization. SSI Biology is currently pioneering enzymatic DNA synthesis methods for use in a portable, autonomous DNA synthesizer operable in space. The team’s work towards safe, accessible, distributed DNA synthesis holds potential not only for science and medicine on Earth, but also for on-site genetic engineering and experimentation in the harsh environment beyond Earth’s atmosphere. We are prototyping a fluid handling platform for automated DNA synthesis using droplet-based electrowetting technology. Our design will allow us to program the movement of tiny droplets on a printed circuit board using a voltage differential. Merging and splitting droplets containing DNA synthesis reagents enable precise control over each reaction step, maximizing space efficiency and minimizing reagent waste. The Biology team is building a DNA synthesizer for short single-stranded DNA sequences called oligonucleotides. Access to a DNA synthesizer in space would greatly increase our adaptability to unforeseen situations, allowing astronauts to manufacture biological compounds necessary for scientific, medical, or practical purposes on-site. Unlike commercial phosphoramidite synthesis, the enzymatic, water-based synthesis methods that SSI Biology is exploring do not require flammable solvents and would be optimized for small-scale, distributed applications such as space missions. 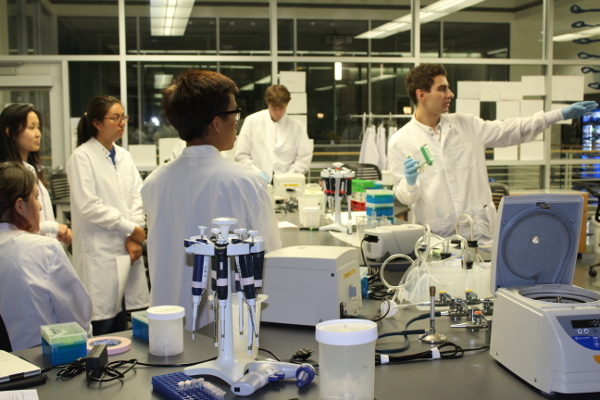 SSI Biology has ongoing collaborations with experts in biological and engineering fields. 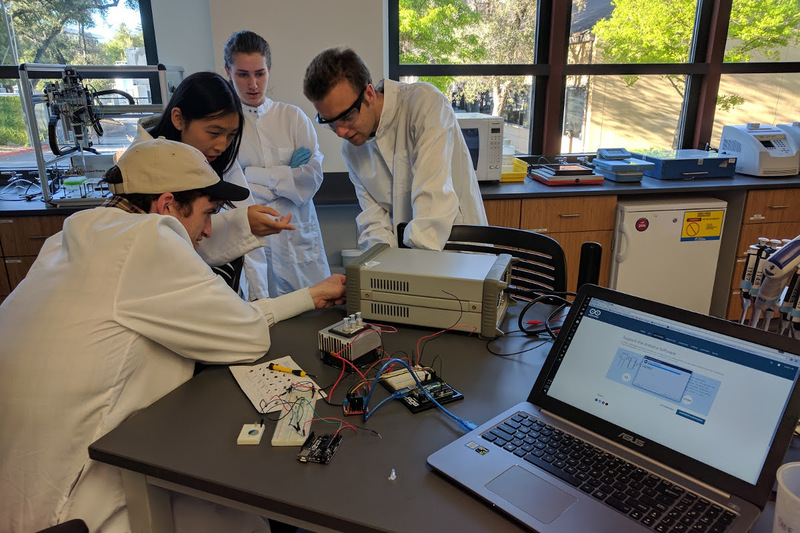 We discuss the latest DNA synthesis methods and fluidics protocols with scientists at the Stanford Genome Technology Center, and analyze previous astrobiology missions with NASA engineers on visits to the NASA Ames Research Center. 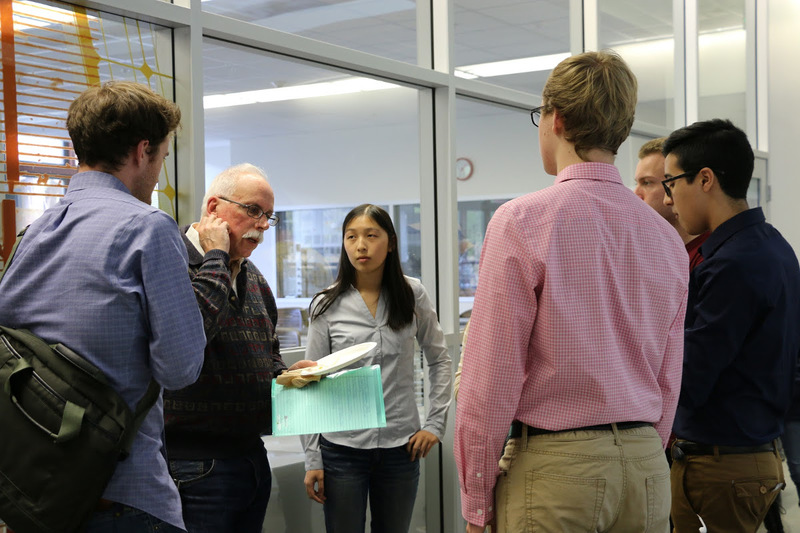 In addition to showcasing our work at SSI-organized events, we periodically review our progress and ideas with DNA synthesis industry representatives and Stanford biology and bioengineering faculty at presentations hosted by the Uytengsu Teaching Laboratory. Want to discover more about biology? Sign up for the biology mailing list.